Please Note: The iDVR-PRO16M is no longer manufactured, please refer to the iDVR-PRO16H as a replacement. The iDVR-PRO16M is a 16 channel hybrid HD CCTV camera system DVR that supports HD security cameras (AHD and HD-TVI) and analog CCTV cameras. Each individual channel of the DVR can be configured for CCTV, AHD, and HD-TVI cameras. 720p and 1080p AHD and TVI cameras are supported. The iDVR-PRO16M can record at 30 frames per second (real time recording) on all channels and at any resolution (including full 1080p high definition). That's 480 FPS total. Because this hybrid DVR is compatible with analog CCTV cameras and the latest HD security cameras, it is a great choice for customers who have existing CCTV cameras and want to upgrade to HD. It is also a great choice for customers that need to mix a variety of CCTV, AHD, and HD-TVI cameras. Customers can use their existing analog cameras on some channels and use the latest 1080p HD cameras on other channels. We expect the need to mix analog and HD technologies on surveillance systems for a long time, hence the invention of the hybrid iDVR-PRO. Please note that the iDVR-PRO is also a great choice for an HD-only system. There is no downside to the DVR supporting SD and HD cameras on all channels. Users can setup all channels for HD. Please note that when selecting the DVD Burner Upgrade, two of the Hard Drive Bays become occupied and the maximum storage capacity is reduced to 12 Terabytes. 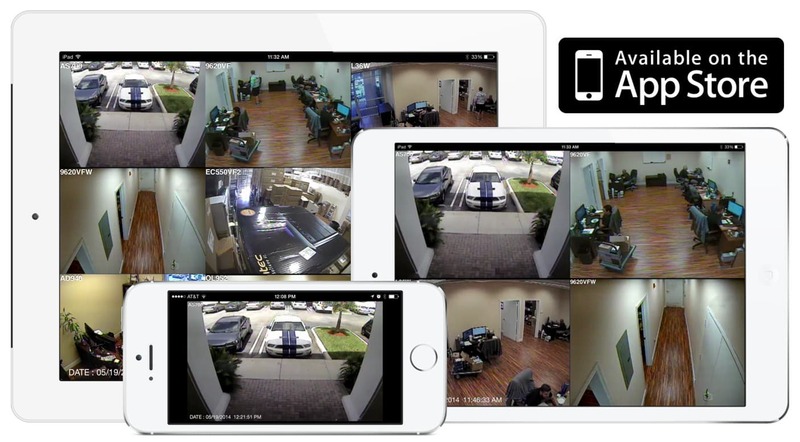 All iDVR-PRO surveillance DVRs include the best software applications to monitor and manage your system from iPhone, iPad, Android, Windows, and Macintosh devices. The user interface that is used to manage the DVR directly using the included mouse or wireless remote control is extremely intuitive and easy to use. These DVRs come with a 2 year warranty and lifetime USA based technical support which is provided directly from CCTV Camera Pros. The robust features and sleek design make iDVR-PRO recorders the best choice for home, business, and government video surveillance applications. Did you know? CCTV Camera Pros can provide a custom HD surveillance system quote that includes a hybrid iDVR-PRO surveillance, any number of cameras, any type of camera (CCTV, AHD, HD-TVI), cables, connectors, power supplies, and monitors? As you have probably already seen on our website, we have 2, 4, 8, and 16 camera surveillance systems in pre-made packages. However, it is not possible for us to package up every combination and quantity of all the different camera models that we carry. So, we can also provide you with a custom quote with as many cameras as you need and a mix of any combination of camera model(s) based on your project requirements. The iDVR-PRO4M is an SD / HD hybrid DVR that works with analog CCTV, AHD, and HD-TVI cameras. This means that traditional analog CCTV cameras and the latest high definition security cameras can be used. All video surveillance resolutions up to full 1080p are supported. Originally, CCTV cameras supported CIF (352 x 240 pixels) and D1 resolution (704 x 480 pixels). Then, 960H resolutions introduced to move towards the widescreen format of the latest monitors and TVs (16:9 aspect ratio). 960H is 960 x 480 pixel resolution. In 2014, AHD cameras (analog high definition), also known as analog HD / HD CCTV, were introduced which supported HD 720p (1280 x 720) resolution. In 2015, full HD 1080p resolution AHD cameras were introduced (1920 x 1080). HD-TVI is another high definition CCTV technology that was introduced and evolved around the same time as AHD. HD-TVI cameras are also available in 720p and 1080p resolutions. All of these video formats (analog CCTV, AHD, TVI) work using the same RG59 coax cable to run video from the camera to the DVR. However, the video encoding is different between them. Hybrid iDVR-PRO model DVRs works with all of these camera types. Users can also mix standard definition CCTV and high definition (AHD and TVI) on the same recorder (hybrid). Each channel can be configured for a different camera type. iDVR-PRO surveillance DVRs are compatible with iOS. The native iDVR-PRO viewer app for iOS works with iPhone and iPad. Users can view CCTV cameras live from their iOS device. The app also supports search and playback of video surveillance footage recorded to the DVR's hard drive. Click here to see our image gallery of the DVR viewer app for iDVR-PRO. The following youTube video demonstrates the remote iPhone DVR viewing capability of the iDVR-PRO. The iOS app for iDVR-PRO lets users view all security cameras connected to the iDVR PRO from remotely over the Internet. NOTE: The video conversion to YouTube degrades the quality of the video. Actual surveillance video viewed on an iPhone is better than what is seen above. Be sure to select 1080p video during playback in the YouTube player. The above screenshot shows the iPhone app for iDVR PRO in playback mode. The users is viewing recorded video with 4 cameras on the screen. To here to see additional images of the iPhone app in live and playback mode. The iDVR PRO is compatible with MAC laptops and desktops. This is one of the few CCTV DVRs available that allow users to view your surveillance cameras remotely over the Internet from a Macintosh desktop or laptop. Mac users have two options for accessing their DVR remotely: web browser access and the DVR viewer software. The iDVR PRO also support remote video playback using the MAC DVR viewer software that is included. The below screen shows the iDVR-PRO at CCTV Camera Pros West Palm Beach office being accessed from a MAC using the Chrome web browser (Safari and Firefox also supported). Please click here to see a complete image gallery of the iDVR PRO being viewed from a Mac. The above image shows a iDVR PRO being accessed on a Mac via the Chrome web browser. The web browser access supports single camera viewing only. Users can select which camera they want displayed via a dropdown box on the web page. The web browser view also supports accessing the DVR's configuration, PTZ camera controls, and viewing the event log. 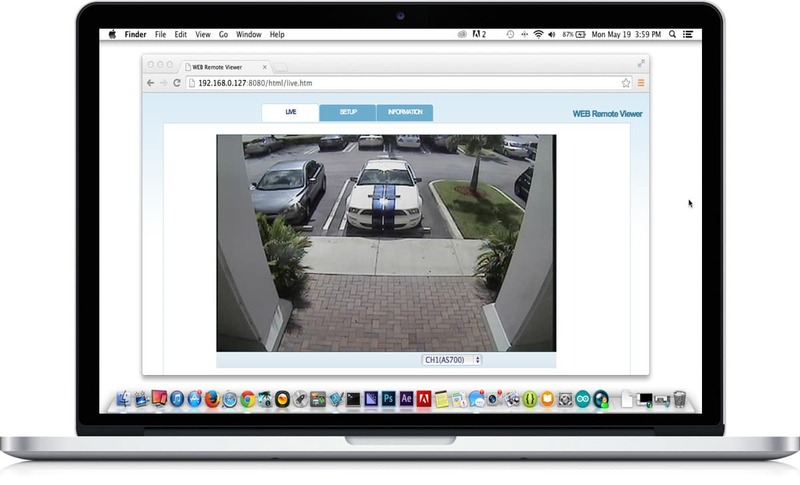 The Mac DVR viewer software that is included with iDVR-PRO recorders lets users monitor multiple DVR locations and view up to 36 cameras per screen. The Mac software also supports remote playback of surveillance video that has been recorded on the DVR hard drive. Please click here to see additional screenshots of the Mac software being used to monitor CCTV Camera Pros warehouse. The Android viewer app for iDVR-PRO lets users view their security cameras on any Android mobile device from remotely over the Internet. The Android app can display 1, 4, 9, and 16 cameras on the screen. In addition to the live camera streaming, the app also has a search and playback feature which lets Android users watch surveillance video that is recorded on the DVR hard drive. Click here to view more Android app screenshots. The following youTube video demonstrates the remote Android remote viewing capability of the iDVR-PRO. The Android app for iDVR-PRO lets users view all security cameras connected to the iDVR PRO from remotely over the Internet. Users can also search and playback video that has been recorded to the DVR's hard drive. The above image shows the Android DVR viewer app accessing the iDVR-PRO at CCTV Camera Pros office in live camera mode (4 cameras on one screen). Please click here to see additional images of the Android app in live viewing and recorded video playback modes. Want to see more images and demonstration videos using the iDVR-PRO? Please click here. Here is the "M" series iDVR-PRO installed in a server rack with the optional rack mount kit.